PULLMAN, Wash. – Recognizing her international reputation in service to language and culture studies, the College of Arts and Sciences named Vilma Navarro‑Daniels recipient of the Marianna Merritt and Donald S. Matteson Distinguished Professorship in Foreign Languages and Cultures. The professorship provides additional funds that Navarro‑Daniels, an associate professor in the School of Languages, Cultures and Race (SLCR), can use to support her innovative teaching and research. The Mattesons are both former longtime WSU faculty members. Marianna taught Spanish and chaired foreign languages for several years, and Don was a professor of chemistry from 1958 to 2012. In the last few months, Navarro‑Daniels has traveled to Spain, Chicago and Chile to deliver invited talks about her work, Lugo‑Lugo said. “Her literary analyses have been published in Canada, the U.S., Chile, Puerto Rico and Spain, among other places, and she has a number of articles coming out in prominent international journals and collections,” she said. She plans to use the funds to advance three distinct projects — one a unique research and education collaboration with colleagues at Universidad Metropolitana de Ciencias de la Educación (UMCE) in Santiago, Chile, and the others focused on her independent research into Spanish and Chilean literature, film and popular culture products. The UMCE‑affiliated project is transregional and interdisciplinary, connecting classical studies, philosophy, social sciences and literary and film studies. It takes a multipronged approach to examine the ways Latin American and Spanish literature and film employ classical myths to question and undermine predominant views about race and ethnicity, gender, social classes and government. The project includes a teaching–learning component to benefit scholars from WSU and UMCE, and utilizes international online student-group discussions “to help prepare our students to enter global society confidently and capably,” she said. The Matteson Professorship will expand Navarro‑Daniels’ capabilities and reach by offsetting costs related to her broader work, such as airfare and conference fees. “It will help bring international visibility to WSU and what we’re doing here and in our new school,” she said. The SLCR was launched in July through an academic realignment of departments and programs within the College of Arts and Sciences. 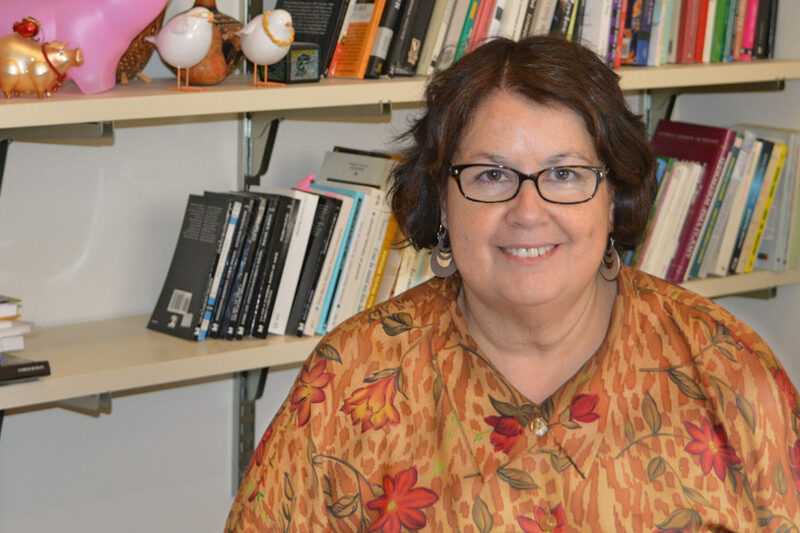 Internationally recognized for her wealth of scholarly research, Navarro‑Daniels is renowned across WSU, as well, for her exemplary teaching, mentoring, outreach, and service in support of students and the broader academic community. She is among the SLCR’s most productive faculty, teaching innovative undergraduate and graduate courses in Latin American and Peninsular Spanish literature film studies and serving on multiple committees to advance the school, college, and University—all while maintaining a strong research and publishing agenda. She has authored numerous journal articles and book chapters and presented at conferences across the United States and abroad. Her research interests bridge the different fields in which she holds a degree: literature and film studies, social sciences, philosophy, and pedagogy. Her expertise in these fields also deeply informs her teaching. She is currently vice president of the International Association of Gender and Sexuality Studies and a member of the editorial boards of two peer-reviewed journals: “Letras Hispanas,” published by Texas State University; and “Contextos: Estudios de Humanidades y Ciencias Sociales,” published by UMCE.